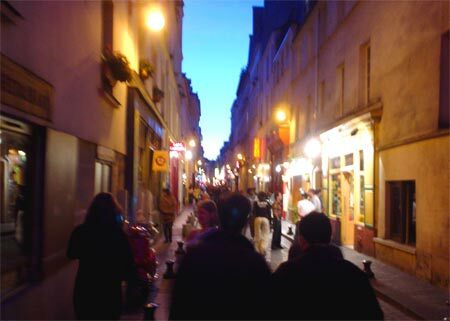 Sweet deep Spring, me and Co. cruising the cultural circuit in Bastille on a crowded Friday night. Starting off with the final dress rehearsal, invite and press only performance of Wagner’s La Walkyrie at the Bastille Opera, a little Wagner goes a long way, so we weren't too depressed bolting after Act 1 and heading over to Café de la Danse. Tickets for the iconic Portugese musician Rodrigo Leão and his Cinema Ensemble group well in hand before getting hold of the opera ducats, so there we were, standing in the passage Louis Philippe, just off the well-trodden rue de Lappe, lingering before the doors opened a good 30 minutes late – probably should have stayed for Wagner’s Act 2. (By the way, at the snack bar at the Opera, I dropped a quick 10 spot on a thimble glass of red wine and a small bottle of water. I didn’t look at the price of the sandwiches.) On the way to the Café, I stepped into the long-standing, trendy Cuban restaurant & bar, Havanita and reserved for later in the evening – the place was already hopping at 7:30 pm. 3-course meal with limited time before the last trains. 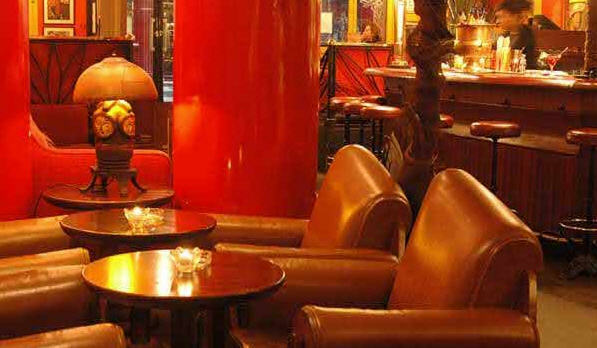 Our dinner ultimately compromised by the hour, we still enjoyed a leisurely meal in the boisterous atmosphere of Havana, Paris style. 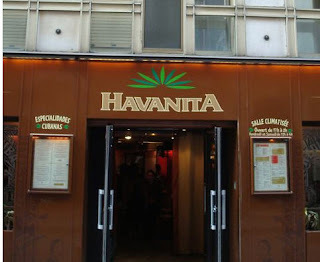 This was our third, I think, visit to Havanita over the years, which I remembered more for its laid-back, casual atmosphere than its gastronomic offerings. Barely able to comprehend the carte what with the conversations raging at a decible level just under screaming so as to be heard over the non-stop Caribbean music, we settled for an entrée split of crabe farci aux saveurs des caraïbes et son chutney de pomme (7.80€). This didn’t look nearly as good as whatever it was the guy to my left had ordered (which appeared to be some shrimp in a banana leaf or something to that effect), but better than what his date was having (guacamole d’avocat). It tasted pretty good, though, as crab should, accompanied with some greens. Maybe with all that racket in the place, it wasn’t surprising when our Iman lookalike waitress glided by and asked to be reminded of Co’s choice of plat, which happened to be pièce de boeuf grilleé d’argentine, sauce aux poivres de Jamaïque et sa pureé de patate douce (16.80€). This dish didn’t look as good as those to our left and right, and the disappointment on Co’s face told me everything I needed to know about Havanita’s beef dish. A big fan of Argentinian beef, it was evident that Co. had much better back in the day, including, coincidentally, during her trip to Cuba once upon a time. 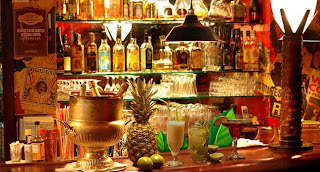 (When I mentioned to Co. how she may be the only person in Havanita to have actually visited Havana, she diplomatically corrected me – doing a quick study of the youthful clientele - by suggesting maybe not the only one, but definitely the first. Mmm, and I will probably be the last.) On a more upbeat note, I thoroughly enjoyed my main dish, the ceviche de dorade et gambas sur en lit de epinard (16.80€). This was a cold dish of marinated rectangles of dorade and, once I determined where they were (nope, not under the table), small morsels of marinated gambas. This on a bed of spinach leaves, dried tomatoes, and spidery red, white, and green sprouts. Accompanied by a side order of haricots noirs (4€ supplement), I was in heaven, not especially because the meal was so spectacular, which it wasn’t, but because it was just a nice change of pace from more typical French fare. 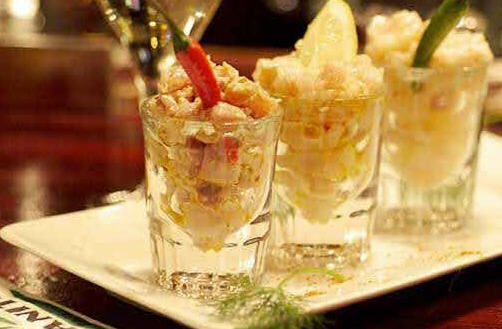 There are many other dishes to choose from, but this is one I definitely recommend. spot for slaking one’s thirst as well, with a well-stocked bar and a plethora of cocktail choices on the carte. Alas, another time. For a restaurant that is more atmosphere than fabulously authentic Cuban cuisine (not even a bloody bottle of tabasco on the table! Sacre bleu! ), it’s a little surprising that Havanita still packs them in after so many years, especially on a street where the neon signs change with such rapidity. 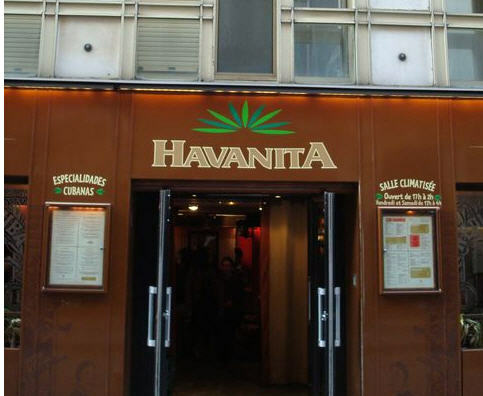 It could be that Havanita has risen to the heights of a Bastille landmark, or that there are so few Cuban/Caribbean venues in Paris, who knows? 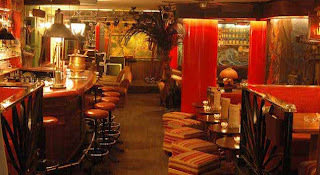 But how I would love to see a truly authentic, cutting edge Southwestern American grille, Mexican cantina (though Celito Lindo next door to Havanita can be considered one of the better Mexican spots in town), Caribbean venue in Paris! 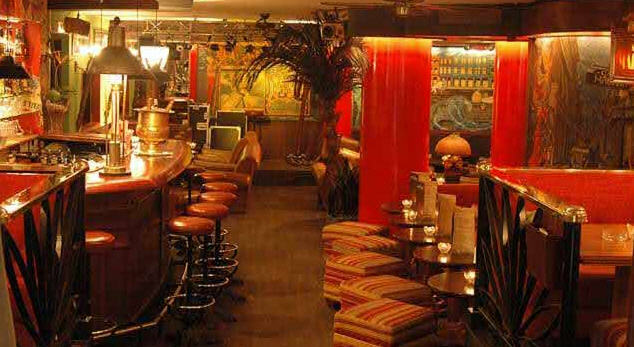 Until that time, if it ever comes, spots like Havanita will have to do. Even the website is noisy!